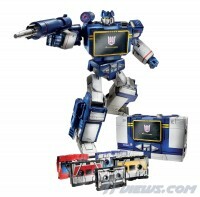 This just in from Hasbro, our first official look at Masterpiece Acid Storm, and Masterpiece Soundwave & Cassette Minions set. The only info Hasbro has on these right now for us is that they are both Toys R Us exclusives coming later this year, pricing and release date info still to come. Note that Rumble is red and Frenzy is blue in the images, these names were taken directly from Hasbro’s image files identifying them as such. Images are presented in large format, make sure to click the mid-size images to view the large-size files as well.